ENRICH® offers an entire suite of Procurement Solutions and Procurement Concierge Services to help our clients succeed; from spend analytics, opportunity assessments and sourcing, to contract management, catalogue management, iProcurement, tail spend management and working capital initiatives. We offer a range of deployment options to suit our clients’ specific needs including; Cloud, On Premise or Hybrid and provide a one-stop shop for implementation and/or managed services to help clients squeeze the maximum value from their Oracle Solution. Enrich® is 100% aligned with Oracle. It’s all we do. With over ten years experience working with Oracle solutions, we’ve helped clients be successful with Oracle across multiple industries and functions. 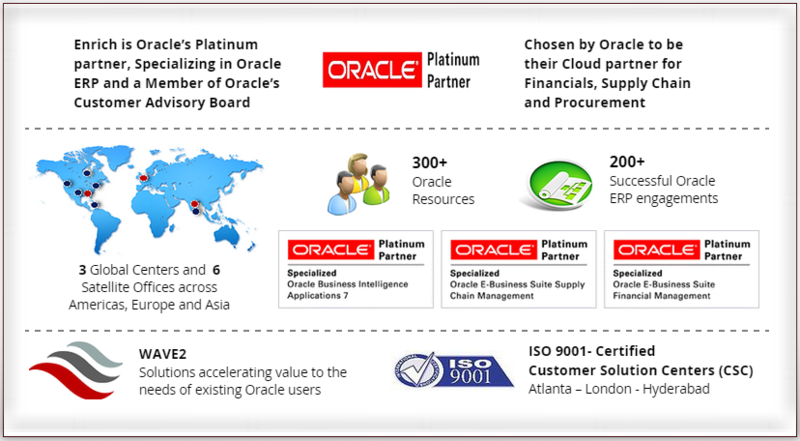 Platinum Partner: Oracle’s recognized credential for exceptional partners who’ve met the exacting standards of qualified people, satisfied customers and robust processes. Business Process Services (BPS) Partner: Enrich® is Oracle’s leading Procurement partner for BPS, providing SaaS/Cloud solutions to clients wanting to focus on successful procurement results without worrying about the deployment of technology. Customer Advisory Board member: Enrich® is one of only a handful of partners who is on the Oracle Advisory Board. Our deep experience with multiple clients and solutions allows Enrich® to provide valuable feedback that goes directly into improving the next generation of Oracle products. EBS R12.2 Early Adopter program: Enrich® was involved throughout the development of the latest version of EBS, testing and providing feedback on upgrades and rollout. Enrich® values our strong partnership with Oracle. It is because of this solid relationship that we are one of the preferred Oracle tier-1 BPO partners in North America selling Oracle based procurement solutions. Our exclusive BPS relationship allows us to sell subscription based pricing (Pay-As-You-Go) using Oracle’s outstanding technology platform alongside our specialized platform services. Enrich® also partners with Oracle on various other initiatives like Application Integration Architecture (AIA) and Process Integration Packs (PIP). As an Oracle reseller, we sell Oracle licenses for both application and technology products. ©Enrich, LLC 2015. All Rights Reserved.